C&K Building waterfalls is C&K's early childhood curriculum framework. It is Australia's first collaborative birth to school age curriculum framework and is universally acclaimed as inspiring and thought provoking, taking early childhood education to a new level. C&K Building waterfalls is based upon enduring C&K philosophy, as well as encompassing contemporary practices and understandings of the early years and it is used by Educators at every C&K service. C&K believes that children do not learn in isolation. It is a collaborative process. 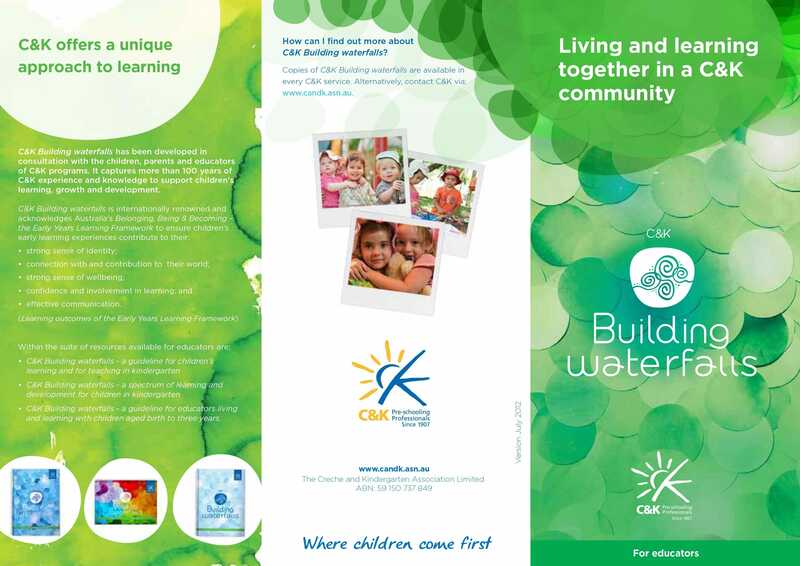 C&K Building waterfalls teaching and learning guidelines acknowledge the important role Educators, parents, other children and the physical environment play in a child's learning.